When I spoke at the D6 Conference, I made an off-handed statement that has generated a lot of questions. In that talk, I said something to the effect that teen rebellion is not found in all cultures. Thus, it is not a universal cultural experience. In other words, it is a myth that teens consistently rebel in every culture and context. People often ask for a source to cite, but I did not remember a recent source where it is spelled out in detail. It is just something known and discussed in anthropology studies. In pre-industrial societies, “adolescents” spend most of their time with parents, often apprenticing with adults, etc. Thus, in my Ph.D. work, I remember reading it and discussing it, particularly in anthropology studies. I would think that most textbooks dealing with anthropology and “adolescence” would address the issues. It’s not only in newspaper headlines–it’s even on magazine covers. TIME, U.S. News & World Report and even Scientific American Mind have all run cover stories proclaiming that an incompletely developed brain accounts for the emotional problems and irresponsible behavior of teenagers…. But are such problems truly inevitable? If the turmoil-generating “teen brain” were a universal developmental phenomenon, we would presumably find turmoil of this kind around the world. Do we? In 1991 anthropologist Alice Schlegel of the and psychologist Herbert Barry III of the reviewed research on teens in 186 preindustrial societies. Among the important conclusions they drew about these societies: about 60 percent had no word for “adolescence,” teens spent almost all their time with adults, teens showed almost no signs of psychopathology, and antisocial behavior in young males was completely absent in more than half these cultures and extremely mild in cultures in which it did occur. Consistent with these modern observations, many historians note that through most of recorded human history the teen years were a relatively peaceful time of transition to adulthood. Teens were not trying to break away from adults; rather they were learning to become adults. Some historians, such as Hugh Cunningham of the University of Kent in England and Marc Kleijwegt of the University of Wisconsin-Madison, author of Ancient Youth: The Ambiguity of Youth and the Absence of Adolescence in Greco-Roman Society (J. C. Gieben, 1991), suggest that the tumultuous period we call adolescence is a very recent phenomenon–not much more than a century old. You can read the article in its entirety at Dr. Epstein’s site, so I will not excerpt more than that lest I run afoul of copyright issues. You can also order it at theScientific American site. Home school advocates have quoted this article for a while and, I think, it can appropriately be used in home school advocacy. You can read more from that perspective in this interview with Epstein. We don’t home school, but I can say that thinking it is normal for children to “raise themselves” in partnership with their peers and then become well-adjusted in their teen years. However, my intent is not to jump in to a home school debate. This is not a home-school issue per se, but rather a cultural one and worth consideration. So, my point is not about Dr. Epstein or home schooling, but I wanted to answer the common question about my comment that not all cultures see teen rebellion… and Epstein probably has the most popular article citing some more research on the subject. So, enjoy a bit of anthropology today, by way of some psychology, in a Scientific American Magazine. Great points! 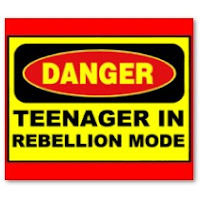 I too have noticed that teens who have good relationships with their parents and are mentored by adults do indeed avoid many of the trappings of teenage "rebellion" in western culture. All the more a call for parents to stick close to their teens, work hard at developing relationships with them, mentoring them, discipling them, making family time a priority etc. providing wonderful plumb lines and foundations to live by in the midst of this relativistic world. I agree with a lot of the information in this article. And I certainly agree with the fact that Teen Rebellion is not mandatory. There are "reasons" for Teen Rebellion just as there are reasons for other deviant behaviors. It is possible to have a loving, mentoring and bonding experience with your children. But first you need an overall view of the issues that cause rebellion as well as the issues that foster disciplined happy teens. I've developed a method for looking at the tough issues and seeing problems at one glance. The Decoder Map – as I call it – will help any parent quickly focus on the "reason" their child is having problems. I hope your readers – and yourself – will take a look at the Decoder Map for Teen Rebellion. If we can work together in any way – I will be happy to.